Yasmeen from Healthy Nut, who served us up a healthy bowl of Kale Barley Soup which she spiced up with garlic, cumin, turmeric and chilli powder. So we all obviously like to be healthy, especially when there is an extra helping of spice. A worthy winner with a strong 21 votes. Congratualtions Yasmeen and thank you to everyone else for serving up such delicious dishes. Head over to Lisa's blog tomorrow to get the heads up tomorrow. Congrats to Yasmeen!! :) Great job! I had fun meeting new foodie bloggers. Thanks so much again to Jacqueline for being a brilliant host and for the lovely write ups for the entries. Yum, that soup does look good! Congratulations Yasmeen!! !Your soup looks delicious!! Great result! 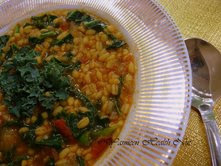 Kale and barley are such wonderful, heatlhy foodstuffs, and so often overlooked. Great to see them taking centre stage!